WAND AGM 2016 - Keep Young and Beautiful! 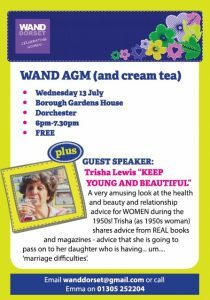 This year we are excited to welcome Trisha Lewis to our AGM who will be giving us important advice from a 1950 women! The AGM is on Wednesday 13 July from 6pm to 7.30 at the Borough Garden’s House, West Walks Dorchester, DT1 1RE. 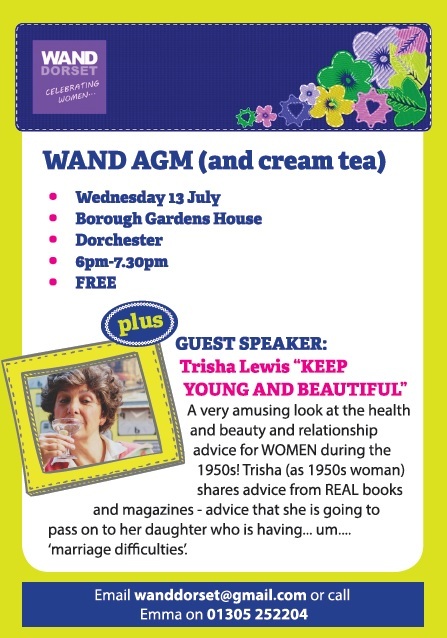 Come along for a delicious cream tea, hear about what WAND has been up to over the last year and join us for some important advice from an earlier era. A very amusing look at the health and beauty and relationship advice for women during the 1950s! 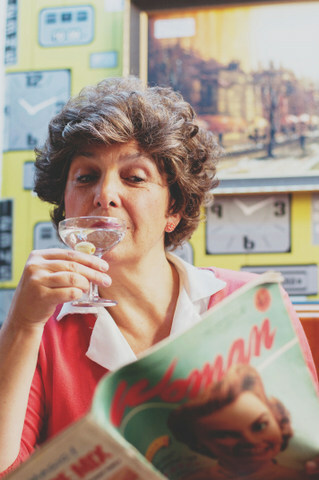 Trisha (as 1950s woman) shares advice from REAL books and magazines – advice that she is going to pass on to her daughter who is having… um…. ‘marriage difficulties’. This entry was posted in Event and tagged AGM, Dorchester, Dorset Women's Week, women on May 16, 2016 by mariac. As ever, a cracking event lined up – well done you WANDies!